Previous Video Google showed the Daydream View VR headset! Next Video DJI Goggle for Mavic Pro drone is ready! EVE: Gunjack, the spinoff of the popular space simulator for the PC, proved itself well on the Gear VR and PC. 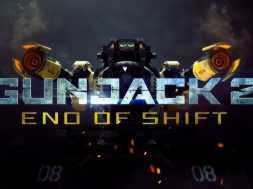 Recently CCP Games announced Gunjack 2: End of Shift, the sequel to this best-selling VR shooter. The game will be available exclusively for Google’s Daydream mobile VR platform and will be released in November 2016. Gunjack 2 is developed by CCP’s Shanghai studio. Gunjack 2: End of Shift seamlessly incorporates the Daydream controller as players use it to aim and shoot down swarms of enemies, strategically deploy their special weapons, and activate their energy shields to survive the most dangerous situations. The game will also include daily generated missions, ensuring endless replayability. Presence and storytelling are also core to the new title and Gunjack 2: End of Shift leverages cinematic cut-scenes and voice acting to makes players feel, more than ever, fully immersed and engaged in the action and narrative of the game. In Gunjack 2: End of Shift players are transported to a heavy-duty mining rig in the Outer Ring of the EVE universe. Part ship and part station, the vast Kubera platform is home, far from the eyes and comforts of civilization. Everyone fights in New Eden. Some fight for power. Others for money. But out here, on the fringes of space, most fight simply to see another day. As a turret operator charged with destroying waves of attackers, players stand united with their crew mates in defense of the rig. These are not soldiers, but survivors, the scourge of would-be plunderers. With a formidable arsenal at their disposal, players will live the life of a Gunjack and protect the Kubera, its precious cargo and their crew, from bandits trying to blow the rig apart! previous Google showed the Daydream View VR headset! next DJI Goggle for Mavic Pro drone is ready!